The Santa Maria del Fiore cathedral in Florence by Filippo Brunelleschi, which has the largest brick dome in the world, and is considered a masterpiece of world architecture. Italy has a very broad and diverse architectural style, which cannot be simply classified by period or region, due to Italy's division into several city-states until 1861. However, this has created a highly diverse and eclectic range in architectural designs. Italy is known for its considerable architectural achievements, such as the construction of arches, domes and similar structure during ancient Rome, the founding of the Renaissance architectural movement in the late-14th to 16th century, and being the homeland of Palladianism, a style of construction which inspired movements such as that of Neoclassical architecture, and influenced the designs which noblemen built their country houses all over the world, notably in the United Kingdom, Australia and the United States of America during the late-17th to early 20th centuries. Several of the finest works in Western architecture, such as the Colosseum, the Duomo of Milan, The Mole Antonelliana in Torino, Florence cathedral and the building designs of Venice are found in Italy. 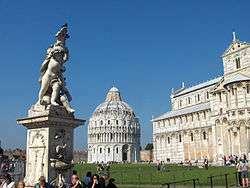 Italy has an estimated total of 100,000 monuments of all varieties (museums, palaces, buildings, statues, churches, art galleries, villas, fountains, historic houses and archaeological remains). 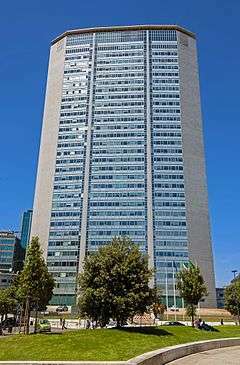 Now Italy is in the forefront of modernist and sustainable design with Architects like Renzo Piano and Carlo Mollino. Italian architecture has also widely influenced the architecture of the world. Being inspired by Andrea Palladio. Additionally, Italianate architecture, popular abroad since the 19th century, was used to describe foreign architecture which was built in an Italian style, especially modelled on Renaissance architecture. The Greek archaeological remains of Agrigento, in Sicily. Along with pre-historic architecture, the first people in Italy to truly begin a sequence of designs were the Greeks and the Etruscans. In Northern and Central Italy, it was the Etruscans who led the way in architecture in that time. Etruscan buildings were made from brick and wood, thus few Etruscan architectural sites are now in evidence in Italy, with the exception of a few in Volterra, Tuscany. The Etruscans strongly influenced Roman architecture, as they too used to build temples, fora, public streets and aqueducts. The heavy pillars and porches created by the Etruscans, and their city gates were also a significant influence on Roman architecture. In Southern Italy, from the 8th century BC, the Greek colonists who created what was known as Magna Graecia used to build their buildings in their own style. The Greeks built bigger, better and more technologically advanced houses that people in the Iron and Bronze Age, and also influenced Roman architecture too. Yet, by the 4th century BC, the Hellenistic Age, less concentration was put on constructing temples, more rather the Greeks spent more time building theatres. The theatres were semi-circular and had an auditorium and a stage. They used to be built only on hills, unlike the Romans who would artificially construct the audience's seats. The Greek temples were known for containing bulky stone or marble pillars. Today, there are several remains of Greek architecture in Italy, notably in Calabria, Apulia and Sicily. An example could be the remains of Agrigento, Sicily, which are currently UNESCO World Heritage Sites. The Architecture of Ancient Rome adopted the external Greek architecture around the 2nd century BC for their own purposes, creating a new architectural style. The two styles that are often considered one body of classical architecture. This approach is considered reproductive, and sometimes it hinders scholars' understanding and ability to judge Roman buildings by Greek standards, particularly when relying solely on external appearances. The Romans absorbed Greek influence, apparent in many aspects closely related to architecture; for example, this can be seen in the introduction and use of the Triclinium in Roman villas as a place and manner of dining. The Romans, similarly, were indebted to their Etruscan neighbors and forefathers who supplied them with a wealth of knowledge essential for future architectural solutions, such as hydraulics and in the construction of arches. Social elements such as wealth and high population densities in cities forced the ancient Romans to go discover new (architectural) solutions of their own. The use of vaults and arches together with a sound knowledge of building materials, for example, enabled them to achieve unprecedented successes in the construction of imposing structures for public use. 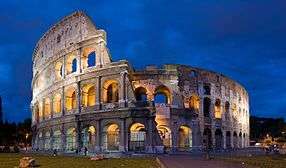 Examples include the aqueducts of Rome, the Baths of Diocletian and the Baths of Caracalla, the basilicas and perhaps most famously of all, the Colosseum. They were reproduced at smaller scale in most important towns and cities in the Empire. Some surviving structures are almost complete, such as the town walls of Lugo in Hispania Tarraconensis, or northern Spain. The lavish mosaics in the interior of the Cathedral of Monreale, Sicily. Italy was widely affected by the Early Christian age, with Rome being the new seat of the pope. After the Justinian reconquest of Italy, several buildings, palaces and churches were built in the Roman-Byzantine style. The Christian concept of a "Basilica" was invented in Rome. They were known for being long, rectangular buildings, which were built in an almost ancient Roman style, often rich in mosaics and decorations. The early Christians' art and architecture was also widely inspired by that of the pagan Romans; statues, mosaics and paintings decorated all their churches. Late-Christian frescos can be easily seen in some of the many catacombs in Rome. Byzantine architecture was also widely diffused in Italy. When the Western Roman Empire fell in 476 AD, the Byzantines were the leaders in the world regarding aspects of culture, arts, music, literature, fashion, science, technology, business and architecture. The Byzantines, which technically were the people of the Eastern Roman Empire, kept Roman principles of architecture and art alive, yet gave it a more Eastern twist, and were famous for their slightly flatter domes, and richer usage of gilded mosaics and icons rather than statues. 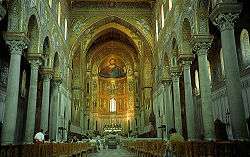 Since the Byzantines resided in Sicily for some time, their architectural influence can still be seen today, for example, in the Cathedral of Cefalu, in Palermo or in Monreale, with their richly decorated churches. St Mark's Basilica in Venice is also an example of Byzantine architecture in Italy. The Duomo of Pisa in the Piazza dei Miracoli, showing the Baptistry. The Leaning Tower cannot be seen. In between the Byzantine period and the Gothic period was the Romanesque movement, which went from approximately 800 AD to 1100 AD. This was one of the most fruitful and creative periods in Italian architecture, with several masterpieces, such as the Leaning Tower of Pisa in the Piazza dei Miracoli, and the Basilica of Sant'Ambrogio in Milan were built. It was called "Roman"-esque because of its usage of the Roman arches, stained glass windows, and also its curved columns which commonly featured in cloisters. Romanesque architecture varied greatly in Italy in both style and construction. Arguably the most artistic was Tuscan, notably Florentine and Pisan Romanesque architecture, yet that of Sicily, influenced by the Norman settlers, was considerable too. Lombard Romanesque was certainly more structurally progressive than the Tuscan but less artistic. Romanesque architecture in Italy halted the construction of wooden roofs in churches, and also experimented with the usage of the groined vault or barrels. The buildings' weight tended to buckle on the outside, and there used to be buttresses to support the buildings. Church walls using the Romanesque tended to be bulky and heavy to support the roof, however this meant that Romanesque church interiors in Italy tended to be far more banal and bland than those of the Early Christian and Byzantine periods. They used to simply consist of marble or stone, and had little decoration, unlike the rich mosaics found in Italian Byzantine architectural works. The main innovation of Italian Romanesque architecture was the vault, which had never been seen before in the history of Western architecture. The neogothic roof of the Cathedral of Milan. 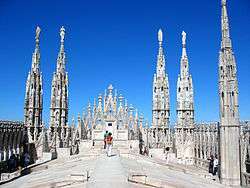 The Gothic architecture appeared in Italy in the 12th century. Italian Gothic always maintained peculiar characteristic which differentiated its evolution from that in France, where it had originated, and in other European countries. In particular, the architectural ardite solutions and technical innovations of the French Gothic cathedrals never appeared: Italian architects preferred to keep the construction tradition established in the previous countries. Aesthetically, in Italy the vertical development was rarely important. a late Gothic phase from 1385 to the 16th century, with the completion of the great Gothic edifices begun previously, as the Milan Cathedral and San Petronio Basilica in Bologna. 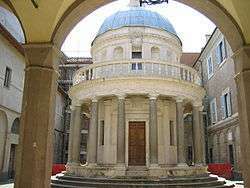 The tempietto of San Pietro in Montorio in Rome, by Bramante. Italian architects had always preferred forms that were clearly defined and structural members that expressed their purpose. Many Tuscan Romanesque buildings demonstrate these characteristics, as seen in the Florence Bapistery and Pisa Cathedral. Italy had never fully adopted the Gothic style of architecture. Apart from the Cathedral of Milan, largely the work of German builders, few Italian churches show the emphasis on vertically, the clustered shafts, ornate tracery and complex ribbed vaulting that characterise Gothic in other parts of Europe. The Renaissance church of San Biagio in Montepulciano. Florence Cathedral, built by Arnolfo di Cambio, was left unfinished by the end of the 14th century, it had a huge hole at the centre, where there was meant to be a dome. 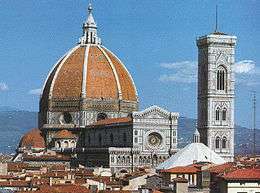 The competition to build it was won by Filippo Brunelleschi, who built the largest dome since Roman times. He cleverly got the whole city excited by getting teams of workers from the eight parts of the city. This church in Florence was designed by Brunelleschi using all the things he had learnt by looking at the architecture of Ancient Rome. It has arches, columns and round-topped windows in the Roman style. It looks completely different from the pointy-arched churches of the Gothic period. Only the inside was finished. The outside is still all rough bricks and no-on knows exactly how Brunelleschi meant it to look. On the inside, however, Brunelleschi taught everyone a new set of architectural rules. When the Ancient Roman Emperors came back from winning a battle, they built a triumphal arch as a monument to themselves. There are several of these monuments in Rome as well as in other parts of Italy, and the general design is that of a big arch at the centre, and a smaller lower arch or doorway on either side. The architect Leon Battista Alberti used this as the design for the front of the church of Sant' Andrea in Mantua. He used the same pattern of tall and arched, low and square, all down the inside of the church as well. This was copied by many other architects. It was also the first building to use columns encompassing two orders, called a giant order. 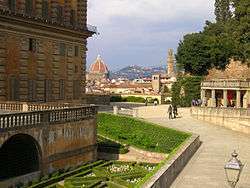 A view of central Florence from the Renaissance Pitti Palace. The most famous church in Rome was the ancient Church that had been built over the grave of St. Peter. By 1500 it was falling down. The Pope decided that instead of repairing it, it should be pulled down and a brand new church should be built. By the time it was finished, lots of important artists had worked on the design, which changed dramatically, becoming more of a baroque example than a renaissance one. Among the architects present on the site there were Donato Bramante, Raphael, Antonio da Sangallo the Younger, Michelangelo, Pirro Ligorio, Giacomo Barozzi da Vignola, Giacomo della Porta, and Carlo Maderno. It has one of the most magnificent domes in the world. It has been copied in many countries. This country house was built by Andrea Palladio (and Vincenzo Scamozzi after his death) from 1566. It is a square building which looks the same from every side. At the centre, there is a dome. On every side is a large porch (portico), like a Roman temple. It is such an elegant design that other architects used the same style which can be seen on churches, houses and palaces, including the White House. 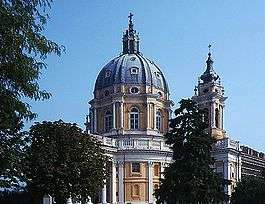 The Rococo Basilica of Superga near Turin. The most original work of all late Baroque and Rococo architecture is the Palazzina di caccia di Stupinigi (Hunting Lodge of Stupinigi), dating back to 18th century. Featuring a highly articulated plant based upon a Saint Andrew's Cross, it was designed by Filippo Juvarra, who also built the Basilica di Superga, near Turin. In the same period, in Veneto there was a rapprochement with the Palladian themes, evident in Villa Pisani at Stra (1721) and San Simeone Piccolo church in Venice (completed in 1738). In Rome, the last chapter of the Baroque season has its most significant achievements in some major urban improvements like the Spanish Steps and the Trevi Fountain, while the façade of San Giovanni in Laterano by Alessandro Galilei, has more austere, classical traits. In the Kingdom of Naples, the architect Luigi Vanvitelli began in 1752 the construction of the Palace of Caserta. In this large complex, the grandiose Baroque style interiors and gardens are opposed to a more sober building envelope, which seems to anticipate the motifs of Neoclassicism. The gigantic size of the palace is echoed by the Albergo Reale dei Poveri (Royal Hospice for the Poor) in Naples, built in the same years by Ferdinando Fuga. 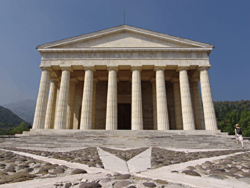 The Neoclassical Temple of Canova in Possagno. In the late 18th and early 19th centuries Italy was affected by the Neoclassical architectural movement. Everything from villas, palaces, gardens, interiors and art began to be based on Roman and Greek themes, and buildings were also widely themed on the Villa Capra "La Rotonda", the masterpiece by Andrea Palladio. Before the discoveries of the lost cities of Pompeii and Herculaneum, buildings were themed on Ancient Rome and Classical Athens, but were later inspired by these archaeological sites. Examples of Neoclassical architecture in Italy include Luigi Cagnola's Arco della Pace, the San Carlo Theatre (Naples, 1810), San Francesco di Paolo (Naples, 1817), Pedrocchi Café (Padua, 1816), Canova Temple, (Posagno, 1819), Teatro Carlo Felice (Genoa, 1827) and the Cisternone (Livorno, 1829). Italy, in the mid-19th century, was also well known for some relatively avant-garde structures. 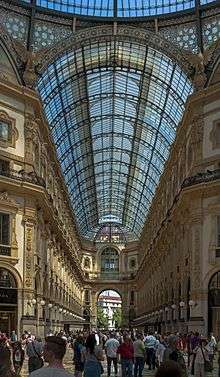 The Galleria Vittorio Emanuele II in Milan, built in 1865, was the first building in iron, glass and steel in Italy, and the world's oldest purpose-built shopping gallery, which later influenced the Galleria Umberto I in Naples. Art Nouveau had its main and most original exponents in Giuseppe Sommaruga and Ernesto Basile. The former was author of Palazzo Castiglioni in Milan, while the second projected an expansion of Palazzo Montecitorio in Rome. However, in the 1920s and following years a new architectural language, razionalismo, was introduced. This form of Futurist architecture was pioneered by Antonio Sant'Elia and hence by Gruppo 7, formed in 1926. 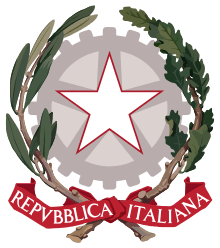 After the dissolution of the group, it was adopted by single artists like Giuseppe Terragni (Casa del Fascio, Como), Adalberto Libera (Villa Malaparte in Capri) and Giovanni Michelucci (Firenze Santa Maria Novella railway station). During the Fascist period, razionalismo was outranked by Novecento Italiano, which rejected the avant-garde themes and aimed instead to revive the art of the past. Its most important members in the field of Architecture were Gio Ponti, Pietro Aschieri and Giovanni Muzio. This movement inspired Marcello Piacentini in his creation of a "simplified Neoclassicism" linked to the rediscovery of the imperial Rome. Piacentini was author of several works in many Italian cities, the most important of which is the controversial creation of Via della Conciliazione in Rome. Two Italian architects have received the Pritzker Architecture Prize: Aldo Rossi (1990) and Renzo Piano (1998). Some of the main architects working in Italy between the end of the 20th century and the beginning of the 21st are Renzo Piano, Massimiliano Fuksas and Gae Aulenti. Piano's works include Stadio San Nicola in Bari, Auditorium Parco della Musica in Rome, the renovation works of the Old Port of Genoa, Padre Pio Pilgrimage Church in San Giovanni Rotondo; among Fuksas' projects (As of January 2011) are Grattacielo della Regione Piemonte (skyscraper of Piedmont Region) and Centro Congressi Italia Nuvola at EUR, Rome. Gae Aulenti's Italian works feature the renovation works of Palazzo Grassi in Venice and the Stazione Museo ("Museum Station") of Naples Metro. Other remarkable figures for contemporary architecture in Italy are the Swiss Mario Botta (Museo d'arte moderna e contemporanea di Trento e Rovereto, renovation of La Scala in Milan), Michele Valori (it:Corviale), Zaha Hadid (National Museum of the 21st Century Arts in Rome, skyscraper "Lo Storto" in Milan), Richard Meier (Jubilee Church and cover building of Ara Pacis, both in Rome), Norman Foster (Firenze Belfiore railway station), Daniel Libeskind (skyscraper "Il Curvo" in Milan) and Arata Isozaki (Palasport Olimpico in Turin, together with Pier Paolo Maggiora and Marco Brizio; skyscraper "Il Dritto" in Milan). ↑ "The Duomo of Florence | Tripleman". www.tripleman.com. Retrieved 2010-03-25. ↑ "brunelleschi's dome - Brunelleschi's Dome". Brunelleschisdome.com. Archived from the original on 16 April 2010. Retrieved 2010-03-25. 1 2 3 Banister Fletcher, History of Architecture on the Comparative Method(first published 1896, current edition 2001, Elsevier Science & Technology ISBN 0-7506-2267-9). ↑ R. De Fusco, A thousand years of architecture in Europe, pg. 443.